A high-end London-based hospitality company unveiled Tuesday plans for two restaurants and an event space scheduled to open in 2019 in the massive Hudson Yards development in New York City. Rhubarb, the hospitality firm known for contract catering in premier London venues such as the Historic Royal Palaces, the Natural History Museum and the Victoria & Albert Museum, plans to open a 5,800-square-foot restaurant on the fifth level of the Neiman Marcus-anchored Shops & Restaurants section of the mall. 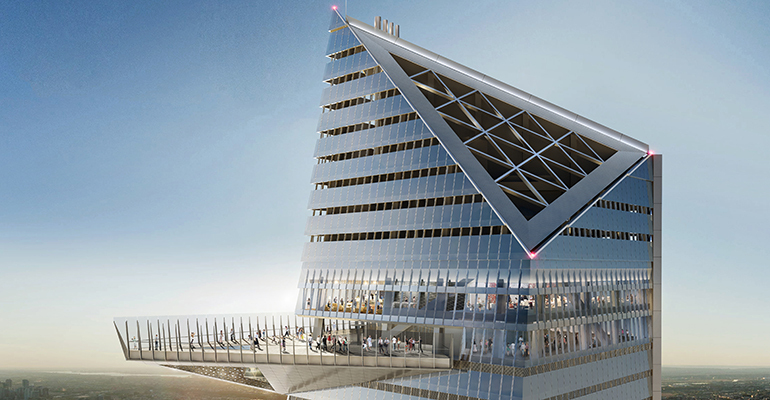 In addition, the group will create and program a 10,000-square-foot bar, restaurant and event space on the top of the 92-story 30 Hudson Yards building, which will be the development’s tallest tower, at 1,296 feet. The two-level venue will offer stunning views of Manhattan and New Jersey, and will house the highest outdoor observation deck in the city, according to press materials. The deck will also include an indoor-outdoor bar. The Hudson Yards outlets will be the first international outposts for Rhubarb. Under development by Related Companies and Oxford Properties Group on Manhattan’s West Side, Hudson Yards is being billed as a “new neighborhood,” with more than 18 million square feet of mixed use space that will include more than 100 shops and restaurants, as well as 4,000 residences, a public school, hotels, and cultural and public spaces. Acclaimed chef and restaurateur Thomas Keller is co-curating the food and beverage venues at Hudson Yards, which will include a new concept by his restaurant group, along with an all-things-Spanish food hall by José Andrés and restaurants by David Chang, Costas Spiliadis, Michael Lomonaco and the UK-based group D&D London. In London, Rhubarb’s concepts include Sky Garden, operated at the top of the Fenchurch tower, as well as Gallery Mess, CODA and Verdi Italian Kitchen in the Royal Albert Hall. The company has catering operations at more than 60 venues, including key events like Royal Ascot.